This is a very simple recipe to prepare rosemary oil. This oil is the perfect companion for bread and meat dishes. 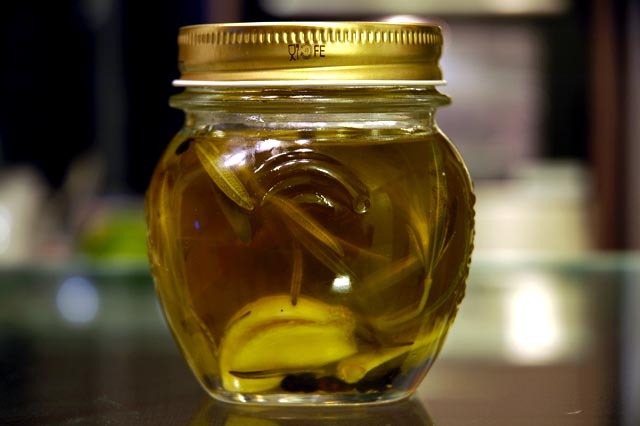 Once prepared, it can be stored in a jar or small glass bottle. Wash some whole rosemary branches and do not remove the leaves from them. Pat dry with kitchen paper. Peel a few cloves of garlic and squash with the side of a knife. Put some extra virgin olive oil (I recommend at least 1/4 of a liter) into a skillet and bring to the heat on a medium fire, until the oil is warm and FAR FROM FRYING TEMPERATURE. If you bring the oil to frying temperature, it will loose part of its aroma. Infuse the rosemarry, garlic, and a few whole peppercorns. Reduce the fire to a very low flame, leave for another 20 seconds, add a sprinkle of salt then remove from the fire and set aside until cool. Store into a small glass bottle or glass jar as pictured, including the rosemarry, garlic and peppercorns. Seal and shake a few times every hour or so, ensuring that the rosemarry is fully covered in oil. This can be stored at room temperature up to a year.